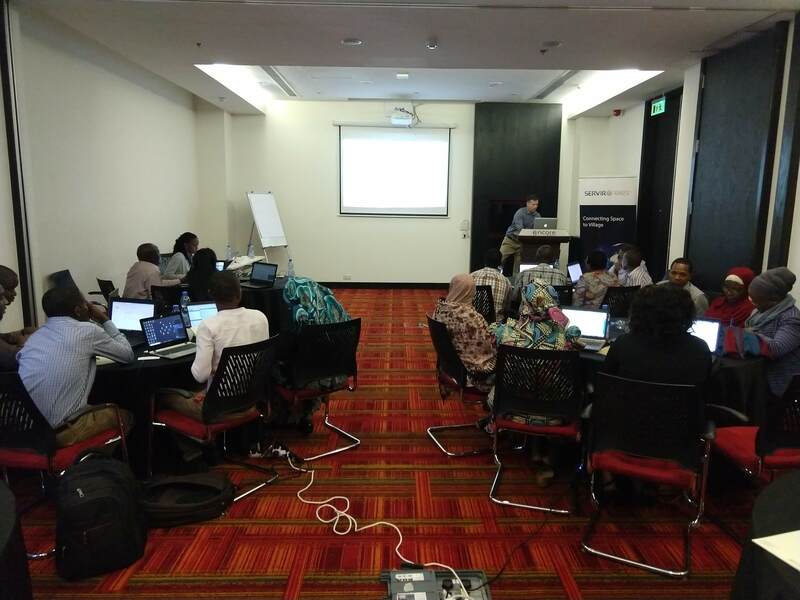 An ongoing partnership between RCMRD/SERVIR-ESA project and the University of California, Santa Barbara (UCSB) has improved the use of hydrological and climate data, information and web services to solve development problems in the Eastern and Southern Africa region. Mr. Dennis Macharia, the SERVIR E&SA Weather and Climate Lead at RCMRD noted that “Data and skills are the two most critical needs of a hydro meteorologist in order to successfully accomplish his or her duties." He added, "In our region, accessing data can be a challenge, and when it is possible, still requires expertise. Our partnership with UCSB and hydro met service agencies in the E&SA regions addresses these challenges quite remarkably." Several training workshops have been completed in the region with the main objective of these training workshops being to provide hands-on training using case studies from the region on access to hydrological and climate based satellite earth observation and model data from the National Aeronautics and Space Administration (NASA) and regional agencies, water availability monitoring and modelling, climate scenario modelling, and crop weather index insurance analysis. Over the last two and a half years, UCSB has been working with RCMRD to enhance access to remote sensing datasets, models and tools that can improve regional hydro climate applications/analyses and ultimately, aiding decision making. One national workshop was held in Kenya in 2017 followed by two regional workshops held in Tanzania and Zambia in 2018 with a group of participants from Kenya, Tanzania, Uganda, Rwanda, Ethiopia, Malawi, Botswana, Mozambique and Zambia. Participants were mainly drawn from hydro-meteorological services. 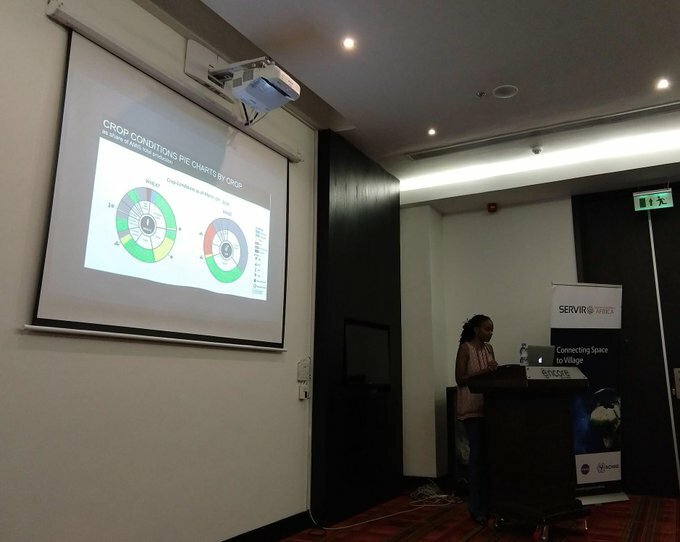 In the third and final joint regional workshop organized with support from the University of Maryland (UMD) and UCSB who are both SERVIR-Applied Sciences Team (AST) grantees took place in Dar es Salaam, Tanzania from February 27 to March 1, 2019. A core group trained in the other two workshops have demonstrated utility of datasets and skills transferred to them. This project benefits both the trainees and the University of California, Santa Barbara’s Climate Hazards Center (CHC) through the reciprocal nature of collaborative training. The trainees were introduced to advanced EOs and web services, and the CHC comprehends the existing needs and challenges in the application of EOs and web services. Mr. Macharia, the activity lead and Mr. Patrick Kabatha a GIT Technical Expert attended the workshop and facilitated at the training. 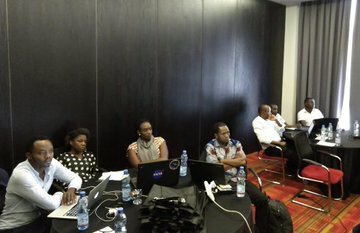 The joint training brought together a core group of participants who attended the previous trainings in Kenya, Tanzania and Zambia and demonstrated useful practical use of the datasets and skills transferred to them. There was a second group of participants drawn from the Tanzanian Ministry of Agriculture (MoA). This group has been working with UMD in implementing the Tanzania Crop monitor together with UMD. In addition to the Agriculture Ministry staff and the regional hydro-meteorologists, RCMRD and her partners added two female participants who joined in the “Rwanda Women in Vulnerability Assessments” workshop held in Kigali in January this year to increase the participation of women in science activities as an approach to implement the SERVIR- ESA gender strategy. The benefits of such trainings span the breadth of the CHC widespread network of affiliates and partners. In the last five years, the UCSB team has produced a consistent rainfall data set and recently, an analogous temperature data set. Both data sets support analyses that are proving useful in addressing developmental challenges in the E&SA countries. The partnership is also providing key skills that are necessary to realizing maximum potential in the use of the data sets, training technical users in different applied skills like climate seasonal scenarios development and hydrological modeling. Send Us Email Sign Up to get the latest updates.